Imagine a stack of one million books. Now imagine that they are all the same book. (For my friends in the 12 x 12 Writing Challenge, just for fun, imagine the book as a published form of one of your own manuscripts. Ahhhh.......OK! Back to reality!) Actually, the enormous stack of books you are imagining is Imogene's Antlers by David Small. It has sold over 1,000,000 copies since 1985 and has been translated into Italian and French (NCCIL). As I write this, I wonder how many times those million books were read aloud and how many children smiled because of it -- AMAZING! I was pretty excited when I found one of the million copies at a used book sale and saved it for for this week's birthday celebration. David Small has illustrated over 40 books for children during a career that began after a college friend told him that, "the doodles he made on the telephone pad were better than anything he had ever written." (davidsmallbooks.com) This statement convinced him to abandon writing plays and pursue art. In 1998, David Small and his wife Sarah Stewart were awarded a Caldecott Honor for their book, The Gardener -- which is one of many books the two have worked on together (The Money Tree, The Library, The Journey, and The Friend). Success continued for Small in 2001 when he was awarded the Caldecott Medal for So You Want to Be President? by Judith St. George. He told CNN that he thought the book would be, "an interesting way to combine.. the work I've done in books for children and the work that I've done for magazines like The New Yorker and newspapers like the Times and Washington Post." My daughter really liked this book because of the all the factual information and stories about the Presidents, however the length was a bit much for my 4 year old son -- however, he loved the Scholastic Storybook Treasures animation of the book. David Small said in an interview with Big Think, "I wrote a book called Imogene's Antlers, which I think it a good example of a book that kids and their parents enjoy. What I try to do in my picture books, is to be all-inclusive, but not exclusive, to not exclude the kids and not exclude the parents from the experience." We couldn't agree more with David Small because all of us enjoyed Imogene's Antlers this week. This story is about a young girl that wakes up with a large set of antlers on her head. Initially, Imogene had some difficulty with the antlers, but soon she is tolerant of her new appearance -- licking a lollipop as the doctor checks her out and sharing donuts with the birds. It was Imogene's mother that really took issue with the antlers -- fainting numerous times and attempting to disguise the antlers with a giant hat. But, for Imogene she really enjoyed her day with antlers and went to bed with a smile on her face. There is a surprise ending and I will not spoil it for those who haven't read the book! 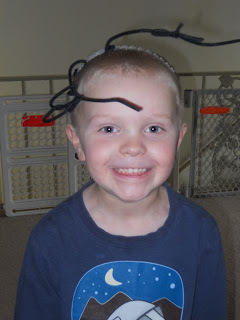 We had a little time before dinner so I grabbed a whole bunch of pipe cleaners and a few headbands from my daughter's room. The task was to make our own antlers. 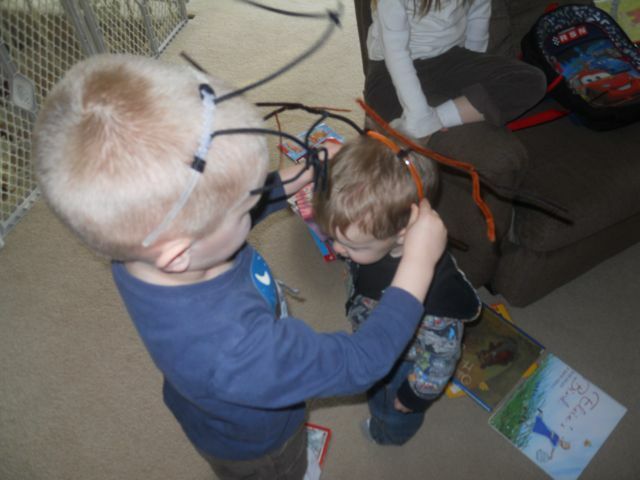 First, the kids twisted the pipe cleaners around the headband. 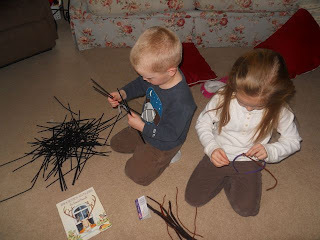 Then, they bent and added additional pipe cleaners to make the tallest set of antlers they could. In the book, Imogene's brother determined that his sister had the antlers of an elk, which in real life can be over four feet high! My son was hilarious when he was wearing his antlers - galloping around the room and making funny faces! His enthusiasm spread to his brother. The Gardener was the only one of these three that I know (and love). And I really like the look of the new One Cool Friend. I so want to know the ending of Imogene's Antlers. I feel the last photo should be in a book!! I thought One Cool Friend looked great too! I will have to hunt it down at our library. Watch the Reading Rainbow episode -- Imogene's Antlers is read in its entirety during the episode! I just checked our library's catalog, and the two copies of Angela's Antlers in the city are in the professional collection, library use only. Can you feel my frustration? I'll request it from one of the several small town libraries that have it available. 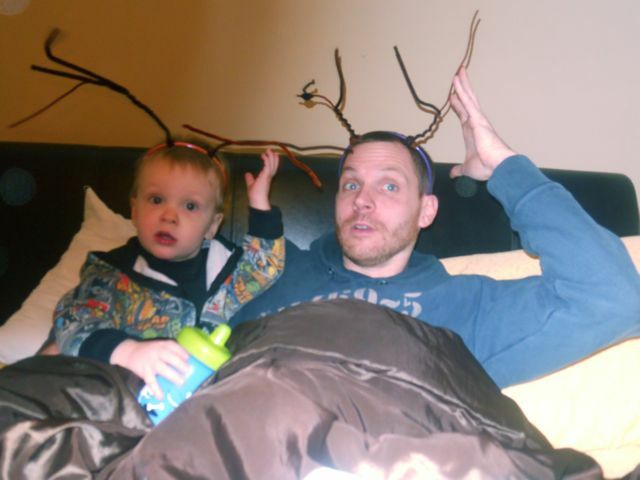 Thanks for this delightful celebration -- love your antlers, all three of you! Beth -- I can imagine that David Small would be a very engaging speaker. I enjoyed watching the BIG THINK interview that I mentioned in the post and the links. I think I have an extra copy of Imogene's Antlers -- let me know I can mail it out to you! There were so many great birthdays this week! It has been a whirlwind on the blog and at our house. Gammell, Yolen, Willems, Small...then Taback tomorrow and I have one for Valentine's Day too. Stay tuned! Loved your review of Leonardo! Thanks for stopping by! I'm doing the antler activity with my kids this week. They'll get a kick out of it. And I haven't read IMOGENE'S ANTLERS in forever. Now I have two great things to share with my kids. Hannah - I would love to hear how it goes! Thanks for joining the celebration! Thanks! I appreciate that you read the post! HA! That last photo is PRICELESS! You look like you all have so much fun with your book activities. Being new to the PB world, I have lots of catching up to do in terms of who's who, so your site is like a Children's Lit 101 class for me. I haven't read any of these, so obviously they're going on the list. Thanks, Eric! Renee - Many of David Small's books were new to us too. One of the reasons I love celebrating author's birthdays is that is gives us a reason to try new books. Thanks again for reading! Another great post and I added a link to my FB Fan Page as usual! Thanks again Sandra! Every share helps! Cute! I will have to add David Small to my reading list. I'm picturing my million books right now. Lol. Thanks for visiting Rena! I think I'd even take a stack of 100,000 books! Loved this post, as I also love David Small. Thanks for sharing your activities! 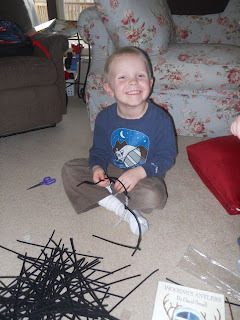 Thanks for stopping by the blog! We really enjoyed reading David Small this week. I also loved watching some of the video interviews (see links section) -- he is fascinating author and illustrator.